As a material, 316-grade stainless steel is a durable and low maintenance option for construction projects and art and lighting installations. Stainless steel has greater weather resistance than other materials such as plastic or wood, and a high-breakage strength – typically 90% in the components we use. Here are two of our most popular stainless steel products, and examples of their applications. Stainless steel wire rope consists of multiple strands of 316-grade wire made into ‘rope’ configurations. For example, 7×7 wire rope is made from seven strands with seven wires in each strand. So, in this rope you have 49 wires – making it extremely durable while also having the flexibility to withstand natural forces and movement. Balustrades – wire balustrades can look sleek, elegant and unobtrusive while providing a safety feature and allowing in plenty of light. 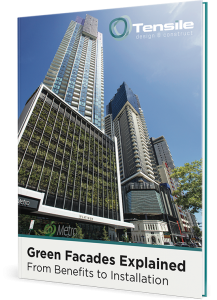 Facades – cables can be used as columns or configured into cross-hatch or trellis structures, making them ideal for green or decorative facades. Catenary lighting – cables are installed overhead for catenary lighting installations. When made from fine wire, the cables become almost invisible, making the lighting display the star of the show. Webnet mesh is made from stainless steel wire and comes in a range of aperture openings – from 20mm to 200mm in customised shapes. This material is extremely versatile. While you might think of wire mesh being used for uninspiring fences, it can be integrated into many types of architectural projects and art installations, blending in seamlessly while adding durability. Car parks – mesh can be used in car-parks to provide fall protection and an attractive facade. 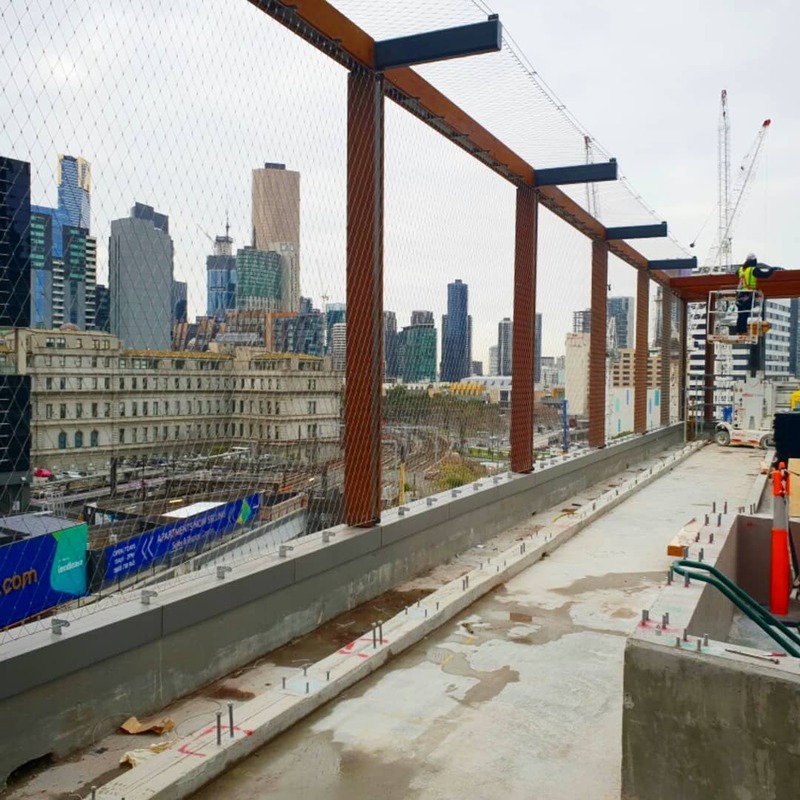 Webnet was used in the Thomas Street Dandenong carpark to bring it up-to-date with current safety codes. Wrapping the carpark in mesh worked out a lot cheaper than enclosing and modifying the whole structure. Playgrounds – Webnet mesh is not only strong but has a flexible, almost fabric-like nature. This makes it ideal for wrapping around children’s playground structures, which often have odd shapes. A classic example is the Ian Potter playground where the curved ‘climbing eel’ was wrapped with 40mm mesh to provide safety without detracting from the design. Bridges – webnet mesh can provide fall protection that appears light but is extremely strong. Mesh was used on the Albert ‘Tibby’ Cotter pedestrian bridge, adapting to the curves and spiral shapes of the structure. 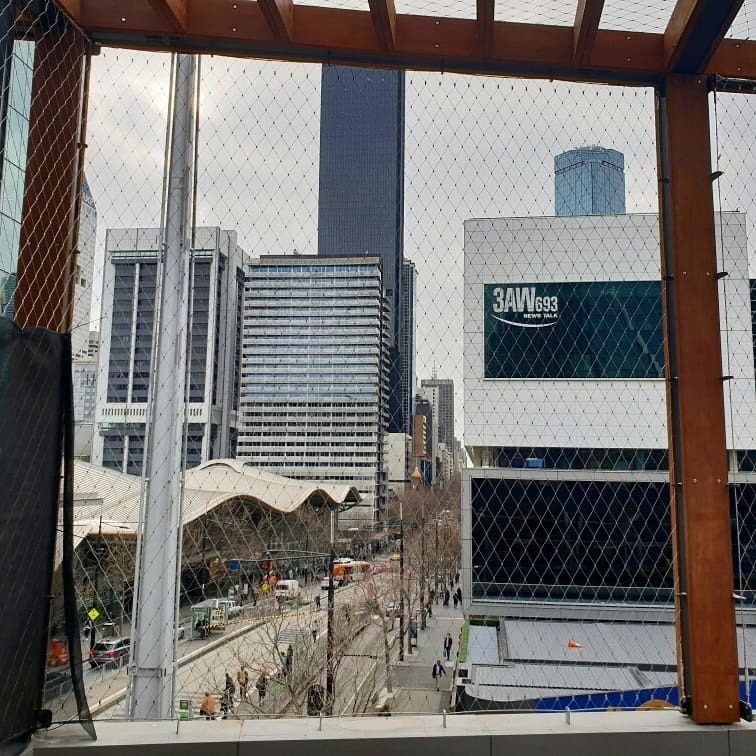 There are many other applications where webnet mesh can be used, including to divide up internal spaces, for green facades, art installations and even large animal enclosures. If you have a project in mind, talk to us about the benefits of using stainless steel wire rope or webnet mesh.